Torino always amazes me. Despite the many years I have lived in this city there is always something new to discover. The Torino Italy Tram Restaurant known as the Ristocolor is one of those discoveries. A couple of our friends suggested we go with them for an experience like few others. Being eager to discover a new way to explore this great city we agreed and am I glad we did. What is the Torino Tram Restaurant? 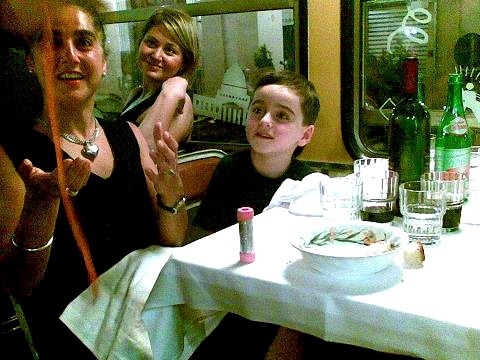 Basically it is an old tram that has been beautifully restored and converted into a restaurant and a good one too. It can seat 32 people and has bathrooms and disabled access. The only problem is that it only runs once or twice a week - at most - so you will need to book. The evenings also vary – we went on one with a magician, which was great for the kids and for me. If you are adults only, and more serious than me, then perhaps the evenings with live jazz or a tour guide are better. The tram leaves at 9pm from Piazza Carlina (a very pleasant part of Turin). The first thing that struck me on getting onto the tram is that this is no shoddy old restaurant – real linen tablecloths and napkins and smartly dressed waiters are the order of the day. Once everyone had arrived we were served our aperitifs, just as we pulled out into the hustle and bustle of Turin on a Friday night. The route was lovely and took us around all the most beautiful sights of Turin, from the. Castello del Valentino through to the Monte dei Cappuccini, Gran Madre di Dio and Palazzo Reale – virtually nothing was missed. The experience of passing through some of Turin’s most beautiful streets and squares while sitting in a great restaurant, eating superb food and with a glass of wine in hand was so special. Let’s get onto the food – perhaps the most important part of the whole thing. I expected to be disappointed for some reason but was actually very pleased with just how good the food was. The menu is fixed and the wine list limited but it was all of exceptional quality. We got through two bottles of wine between the four adults - all for the sake of research of course and just to be sure of the excellent quality! An important tip is to book on a cooler day if you can, the tram is not air conditioned so on a very hot evening it could be a little uncomfortable.